Bentley Coffey, Patrick McLaughlin, and Pietro Peretto have an interesting new paper on The Cumulative Cost of Regulations. They attack two of the big problems in quantifying the effect of regulations on the economy. First, measurement. To get past regulatory horror stories, just how do we measure the problem? They use the Mercatus Center's new RegData database, which is based on textual analysis of the Federal Register. Third, estimation. They use the variation in industry outcomes related to differential regulation of those industries to estimate the effects of regulation on investment. If regulation had been held constant at levels observed in 1980, the US economy would have been about 25 percent larger than it actually was as of 2012. Chad's graph differs from mine for a few reasons. 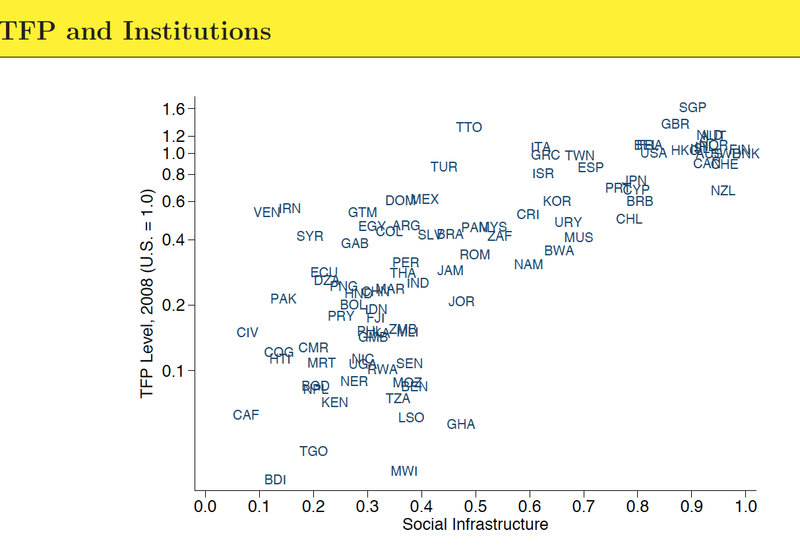 First, his index of "social infrastructure" from the world bank is more comprehensive, including Accountability of politicians, Political stability, Government effectiveness, Regulatory quality, Rule of law, Control of corruption. Second, he has total factor productivity on the Y axis. The vertical axis is a log scale, so read carefully. 1.6 (Singapore) is a lot more than 1.0, though they are compressed on the graph. Confidence and prediction intervals help a lot and would eliminate much of the confusion stemming from these sorts of regressions and their subsequent conclusions. 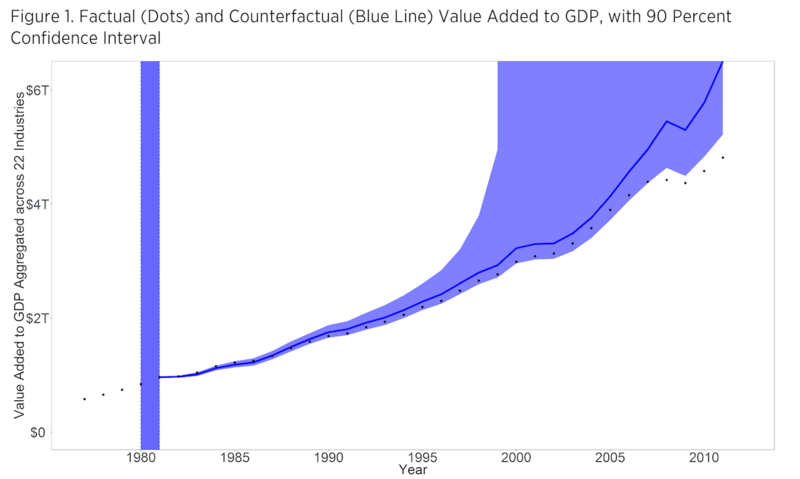 If real GDP had continued to grow after 1980 at the 1946-1980 rate, it would have reached $22 trillion in 2012. That's $7 trillion above the BEA estimate for 2012. If regulations adopted after 1980 account for $4 trillion of that lost growth, what accounts for the rest? Non-regulatory inhibitors of growth (e.g., higher payroll taxes, the continuing rise in "social programs")? Underestimation of the positive effects of technology on real GDP (e.g., qualitative improvements in products and services)? As a NZer, I'm interested in our position well off the curve in that graph. Great social capital, poor TFP. Clearly something to think about. 1. NZ may be friendly for new and small businesses, but once a certain firm size is reached (ca. 12+ employees) things become rather restrictive. 2. The RMA is an unprecedented barrier to personal property rights, restrictive on the same order of magnitude as any of the bureaucratic messes and zoning laws in US or UK. 3. A small, isolated population, with a pervasive anti-intellectual culture and rest-of-the-world inferiority complex. Meaning: as a market for international trade, NZ is not lucrative; the best and brightest go overseas; Kiwis are righteous in their dismissing of clever but foreign ideas and methods; value cheapness far more than intelligence; and do not face regular comparative reflection with other countries and cultures to see the flaws in their own ways. None of this is captured in the usual social / business metrics. Nice post and I liked the way you explained by using graphs.